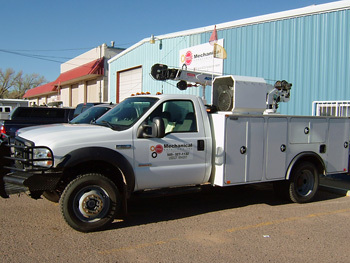 Mechanical Solutions, Inc. started in 2005 in Farmington, NM servicing natural gas compressor packages throughout the Four Corners of New Mexico, Colorado, Utah and Arizona, and Wyoming. At the root of our company are our core values that are central to our culture. Our core values are based on integrity, excellence, tradition and safety. Integrity — We deal honestly and fairly with all customers, vendors, coworkers and employees. We take full responsibility for our actions and their consequences. Through our actions we aim to earn the trust of those we work with (coworkers) and those we work for (customers). Excellence — We strive continually to learn and improve so that we may achieve the highest ideals of customer service. We encourage creativity, innovation and vision so that we may achieve excellence. Tradition — We are proud of it, we learn from it, we are not bound by it. We use what we've learned in our past to meet the challenges of the future. Safety — We believe that no job can be considered a success without all of our employees returning home safely each day. We firmly believe that the safety of our employees, customers, subcontractors, the public, and the environment cannot be compromised by our operations. We will always place safety ahead of all production goals. If a job cannot be completed safely it will not be done. For directions, maps and phone number please go to Contact Us.